I am new to graphics design and this is my first post here. Now, what I want is to create the pile of tokens. What can I do? Can I use a 3d software such as blender (model, texture a token, and then duplicate it) to make the pile or is there an easy way to do this with photoshop? Your help is really in need. Thank you very much ..!!!!!! You can create the tokens/coins by setting up a custom brush. I would recommend doing this in Illustrator as a custom scatter brush because doing so gives you more flexibility in creating and modifying your artwork. 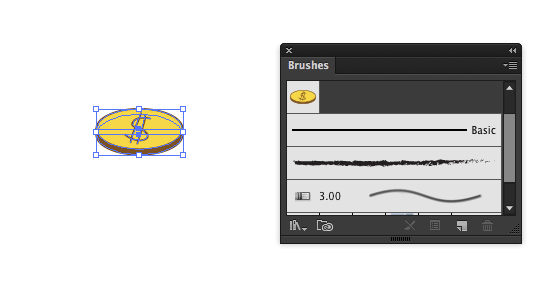 In Illustrator, each coin is "painted" by the brush tool as a separate object and can easily be modified as a group and then expanded and further edited individually. In Photoshop the coins would be painted on a single layer which can make it more challenging to separate and edit. 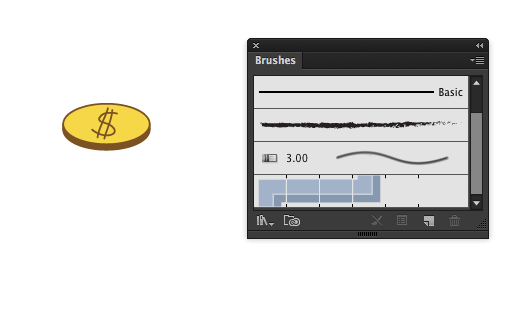 Create/draw a token/coin (group any separate elements together), then open the Brushes panel. Select the coin art and drag it onto the Brushes panel. When the New Brush dialog appears, select Scatter Brush. 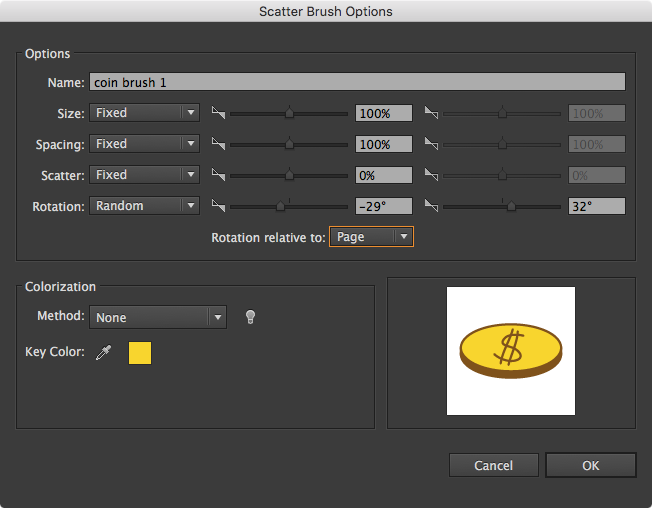 The custom scatter brush will appear in the Brushes panel. To add variety, follow steps 1-5 to create additional versions of the coin. In the second version I repositioned the dollar symbol and set the brush rotation to -38 degrees / 50 degrees, to make the dollar symbol differ from the first coin. Using the Brush tool, switch between your different custom scatter brushes and paint the tokens/coins. Each object will be created as a separate object that can be individually moved and arranged. If you want to edit the individual coins (to adjust shape, add color, alter the symbol, etc. ), you'll need to Expand Appearance, then make the edits. Not the answer you're looking for? Browse other questions tagged adobe-photoshop 3d blender or ask your own question. How do I drain this pattern of color to add it?